DFM Concurrent Costing 3.0 software from Boothroyd Dewhurst, Inc. is calculating the optimum machining time and cost for a rough cylindrical turning operation for a stainless–steel part. Recommended cutting speeds and paths are automatically taken from the DFM library and applied to the hardness of the stock stainless steel. In the window to the lower center, a management report is shown for material, setup, process, and reject costs. A wide range of materials and process alternatives, along with primary cost drivers, can be reviewed on this page, often leading to significant savings. Graphic courtesy of Boothroyd Dewhurst, Inc.
Boothroyd Dewhurst DFM Concurrent Costing 3.0 offers best–cost estimates and allows manufacturers to move beyond 'price' models. WAKEFIELD, R.I.–The latest software release from Boothroyd Dewhurst, Inc., is aimed at guiding manufacturers toward optimum process and material choices for machining, casting, plastics, and sheet metal–a path that leads to innovation and significant savings, the company said in a press release. The software, DFM Concurrent Costing, Version 3.0, supports OEM supply chain partnerships with science–based estimates and best–cost practices. Deployed as a cost–analysis tool for engineering and procurement teams, the latest software allows manufacturers to move beyond "price" models, based largely on past bids, to industrial cost models grounded in scientific test data and studies. The result is a highly reliable "should cost" view of the product that offers insight into hidden cost drivers and ways to optimize both design and production. DFM 3.0 allows OEMs and their suppliers to explore bids in a neutral framework where machine types, speeds, processing sequences, and optimum levels of automation are discussed. This better–informed environment encourages supplier suggestions and deeper, integrated partnerships built around expertise, best–cost practices, and shared goals. The differences between traditional price models and data–driven cost models can be very significant, affecting decisions about what regions or countries a product is moved to for manufacturing. Properly designed and costed products are more likely to stay at their original manufacturing location and near existing resources. OEMs and suppliers can collaborate around DFM software to address these and other strategic issues. 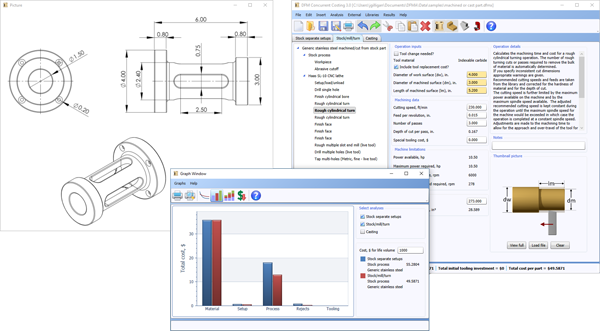 When done early in design or during prototyping, DFM analysis has been shown to reduce time–to–market, impact direct and indirect costs, and help optimize product functionality. It can be used by individuals or teams in making trade–off decisions to lower costs. "We see a rise in procurement personnel joining engineering for the supplier phase of design review," said Keith Gilligan, Boothroyd Dewhurst, Inc. business development manager, in a statement. "To better serve this new group of users, we've enhanced our Manufacturing Profiles feature. Now you can compare manufacturing costs across U.S. geographic regions, and then to those in China, with just a few clicks. With more emphasis these days by OEMs on supplier involvement and improved logistics, the Profiles are proving useful. Producing close to your markets is increasingly favored by manufacturers looking to reduce risks and realize stronger profits." Gilligan added that Boothroyd Dewhurst has rebuilt the software architecture of DFM 3.0 with "the most advanced, up–to–date development tools available." "It's faster and easier to do an analysis now because the calculations occur instantly. The new architecture makes it easier to integrate with existing company resources, such as Manufacturing Resource Planning." Boothroyd Dewhurst, Inc. (www.dfma.com) is the developer of internationally recognized Design for Manufacture and Assembly (DFMA®) software, which enables engineers to evaluate, estimate, and reduce the manufacturing cost of a product in the design phase through product simplification and cost estimation. The company is reported to be the first to commercialize Design for Manufacture and Assembly (DFMA) methodologies and software tools, which have since grown in prominence.